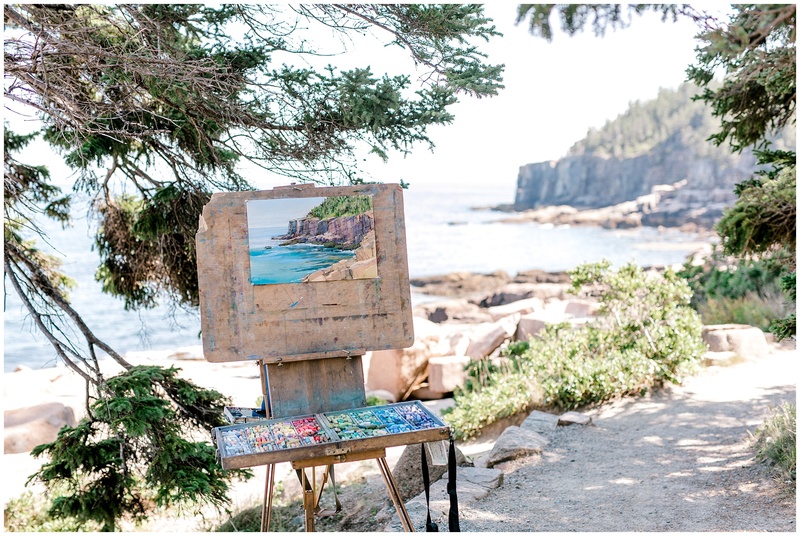 In 2018, I photographed over 30 portrait sessions in Acadia National Park! My husband and I have been here a few times together for a weekend getaway, and we even took a big family trip here in 2017 with all of my siblings and their spouses, as well as my Dad and Stepmom to celebrate Father’s Day! 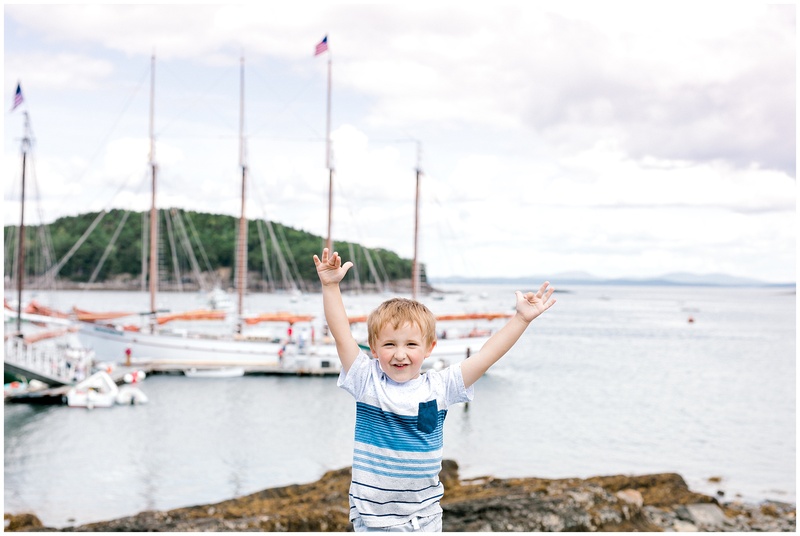 I could write an entire separate post on why I love Acadia so much. Being there honestly feels like you’re in a different world. Every turn you take opens up a gorgeous new landscape to feast your eyes on. Sunrise and sunset are unparalleled in the colors, and the rocky cliffs that cut against the vast ocean is just something you have to see in person! 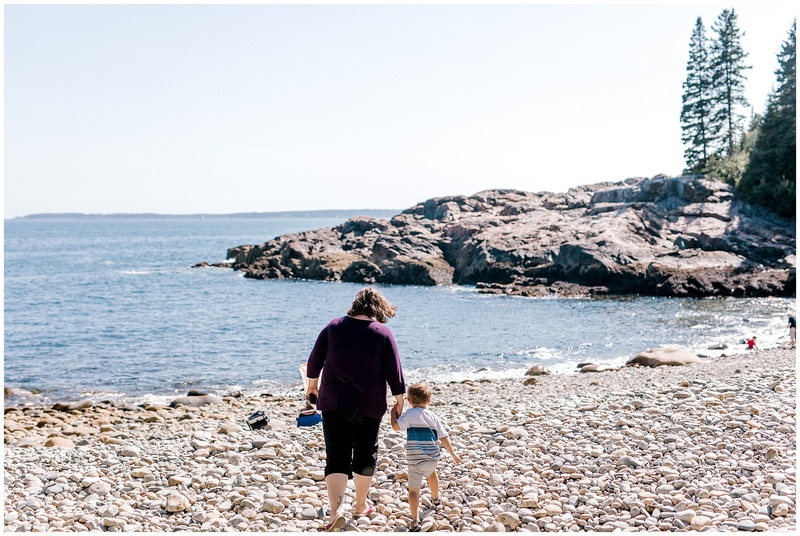 Last summer, I was looking at my schedule and trying to figure out childcare for a Monday that I had booked both a sunrise and a sunset session in Acadia. Being a 2+ hour drive from my house, I knew that meant I would need to spend the entire day in the area, and since my husband works 8-4 at a school, I would need to find someone to watch Zane all day. My youngest sister, Autumn, is 15, and helps me out with childcare sometimes. It was then that I had an idea – why not bring them with me for the day, and instead of spending my off time at a coffee shop editing on my laptop (which is what I would usually do! ), I could show them around Acadia?! Autumn asked if she could invite her friend, Clarissa, with us, which I thought was a great idea! 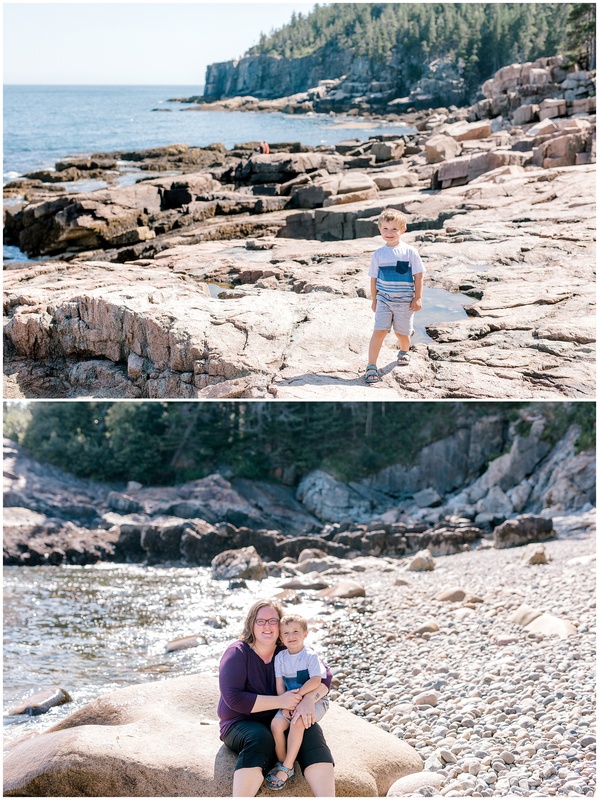 Our trip also happened to coincide when my husband’s brother, Jason, would be camping in Acadia for the weekend, so we were able to meet up with him as well! Due to my first session being at sunrise (6am! ), we decided to drive up the night before. I had a sunset session in Southern Maine that evening, so after getting home around 9pm, I picked up Autumn, Clarissa, and Zane, and we made the long drive to Mt. Desert Island! After stopping for dinner, we got in around midnight, and all crashed into bed at our hotel for the night. 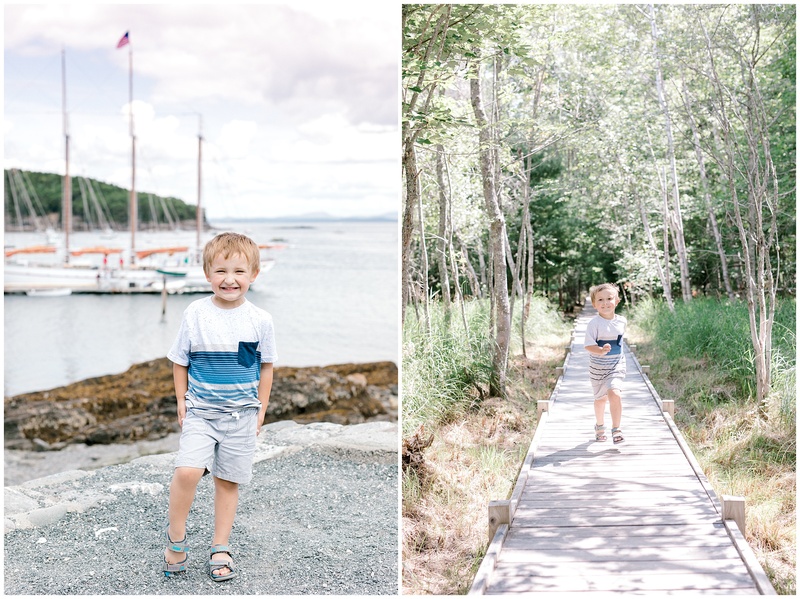 I woke up at 5am and headed out to my sunrise session – an adorable extended family vacationing in the area from out of state. 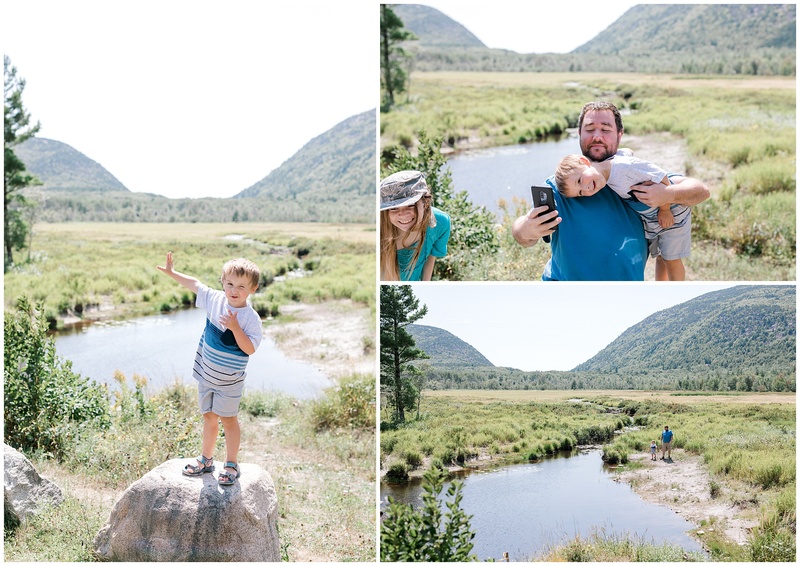 We did their session at Jordan Pond, which was deserted that time of day, so we had the gorgeous setting to ourselves! When I got back to the hotel, I slept for a couple of hours, and then we all checked out and went to meet Jason for breakfast. 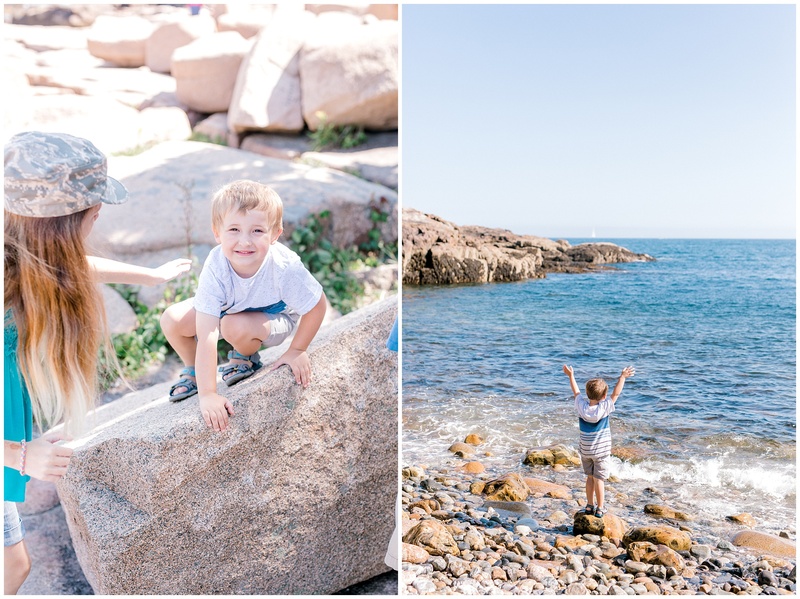 One thing about taking your own “professional” photos of your kids or family, is that you rarely get that beautiful light that you work so hard to get when you schedule your client’s sessions! 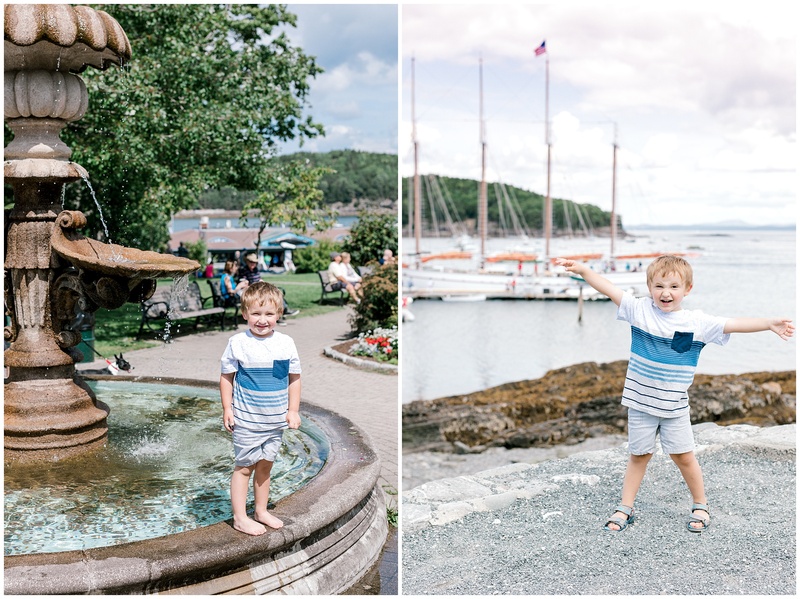 Normally, I would never take pictures in harsh sunlight during the middle of the day, but when you’re on a family adventure, that’s what you do! Scroll down to read the more about our day and see some fun pictures! Above, Jason trying to take a selfie with Zane, and taking him to explore an area down by the river. 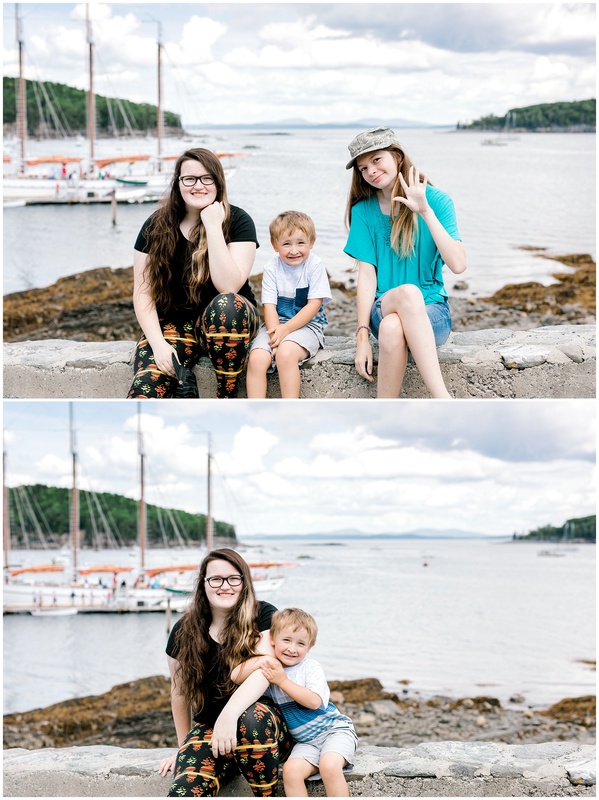 Below, Autumn and Clarissa posing for a photo with Zane in downtown Bar Harbor. Zane LOVES his Auntie Autumn! Can you tell?! 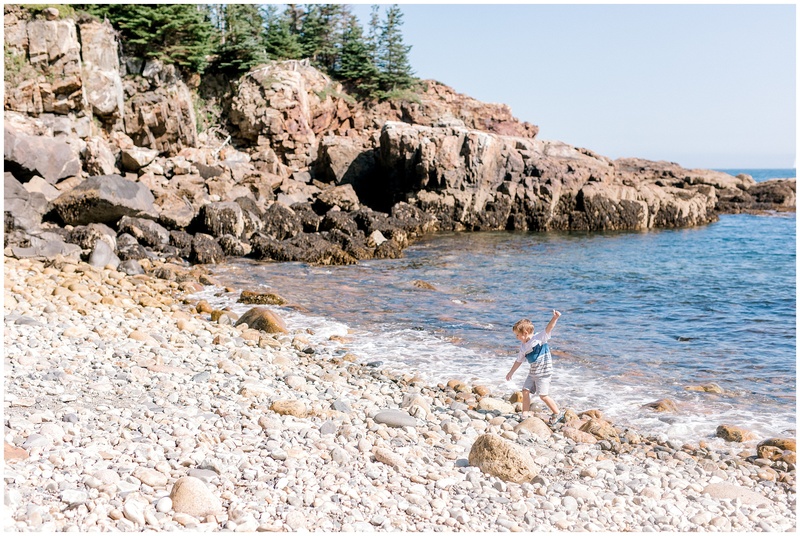 Below, I took the kids to Little Hunter’s Beach, one of my favorite spots in Acadia. Though they’re hard to walk on, this beach is made up of thousands and thousands of large, smooth pebbles. Zane could have spent hours here throwing the pebbles into the ocean. It was a 4 year old’s paradise! 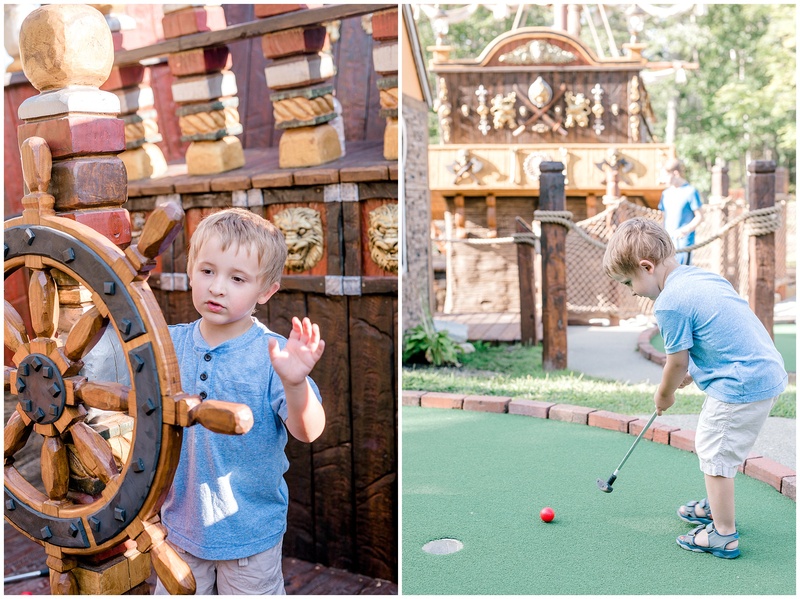 We took a break from sightseeing to have some fun at Pirate’s Cove – an awesome mini golfing adventure! 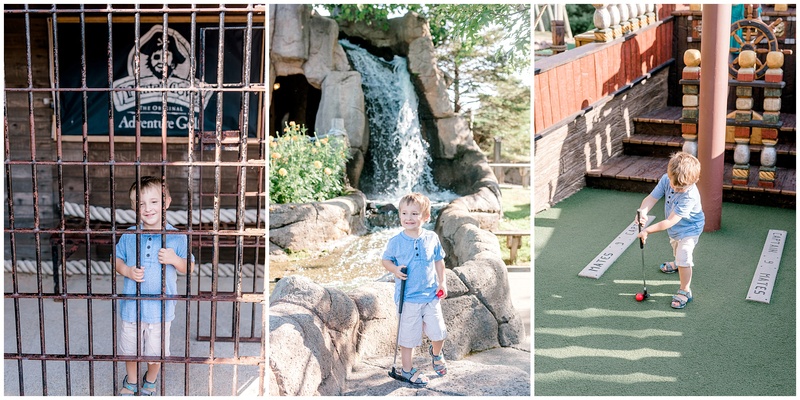 All of the kids enjoyed hitting their ball through waterfalls, and even on a pirate ship! Because I was taking pictures most of the day, I didn’t get a chance to be in many! But my little sister took this picture of me walking with Zane without me knowing, and I love it! Above, the only other picture I got in that day 🙂 Here’s me with my sweet little boy! At the end of the afternoon, I dropped Zane off with his Uncle Jason at his camping site, where they made a campfire and ate some S’mores! Clarissa and Autumn came with me to Cadillac Mountain, where my evening session was taking place. 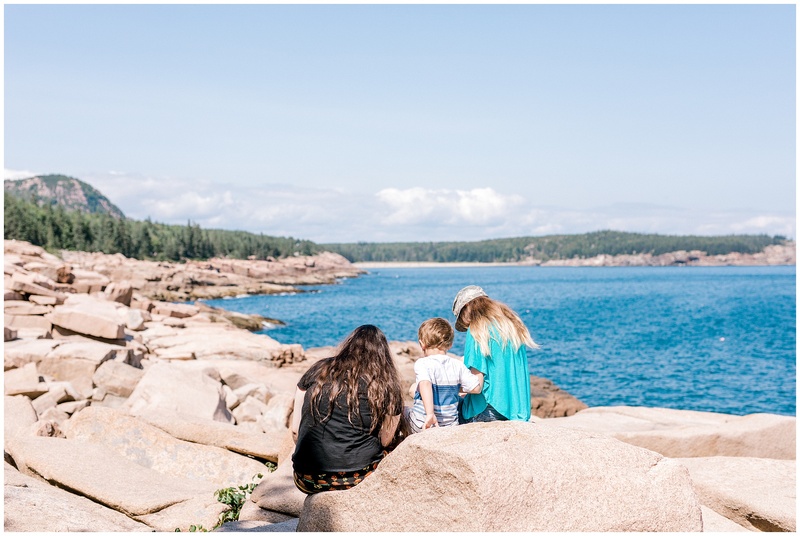 They hung out and got to watch the sunrise on Cadillac Mountain while I photographed a beautiful little family vacationing here from the other side of the country! What a fun day! 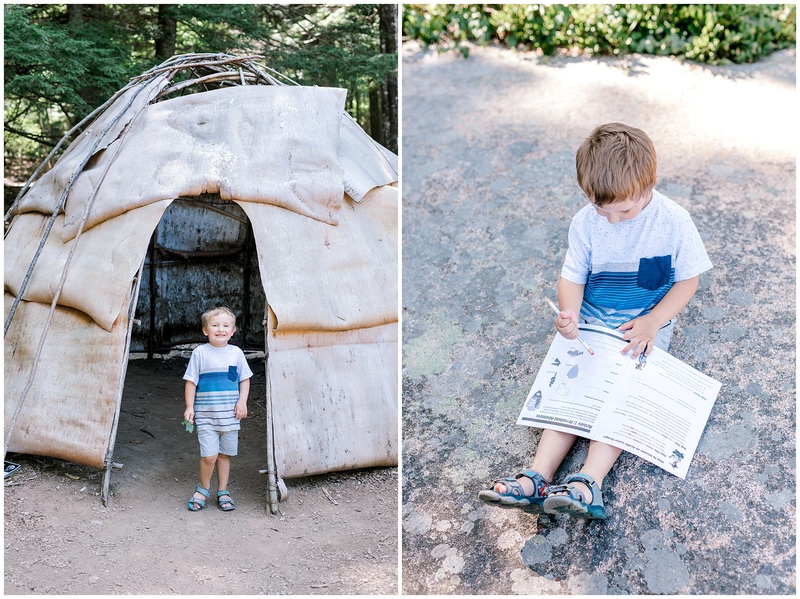 It was exhausting, but I love when I get to squeeze in some fun family adventures in between working!